contracted to Brookfield Multiplex for construction. Elenberg Fraser’s design has also gained attention from its unique curved glass design to allow more natural light into the apartments. Architecture and Design that the design was one of the smartest external assemblies in Australia. “The design caters towards wind and natural lighting vectors, while the unique angling of the facade and parametric external patterns maximise view lines out towards the bay and surrounding CBD,” he said. The façade of the tower also incorporates a new glazing prototype which utilises some of the latest glazing technology. 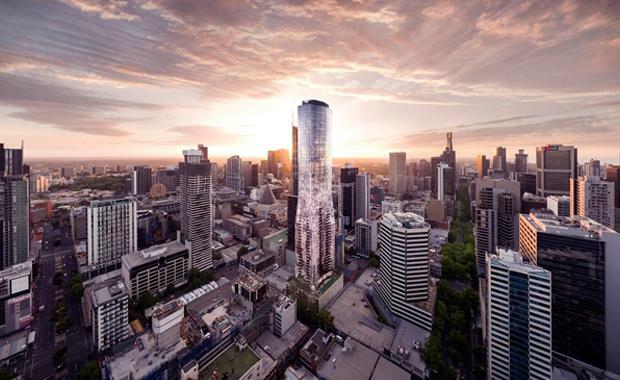 The tower will be positioned on A’Beckett Street between Queen and Elizabeth Streets, short walking distance from Melbourne’s Queen Street Market, Flagstaff Gardens and the CBD. The residential development is also located near an array of bars, restaurants, cafes and shopping hubs in the heart of Melbourne. Eq. tower is due to be completed in June 2017.